Busted iPod? We’re the guys that make it all brand new again. From your precious 1st gen iPod that needs a service, to the latest iPod Touch, our experienced technicians can have your iPod banging out your favourite tunes in all its glory and looking as good as ever, in no time at all. Taking your iPod to an Apple store may have been easy in the past, especially if it was still under warranty. These days, the popularity of Apple products has skyrocketed, which means you may not be able to get your iPod repaired very easily or within a quick timeframe. Our professionally trained team can look at your iPod and diagnose whatever problem it’s having and get to work on it ASAP. Most of the devices we work on will be back in the owner’s hands within a few days. 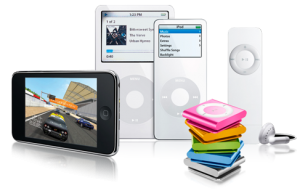 Get in touch with our service centre in Sydney for Apple iPod repairs today! For pricing or a quote click here or call our Chatswood store on 02 9412 4368.